Yummi Pouch was kind enough to give me some pouches for SweetPea to try and I must say we are HUGE fans! They were easy to clean and I love that I now know what is in my daughter's pouches. We have tried multiple other pouches products with the food already in them, but I was always uneasy about exactly what kind of preservatives were in them. Plus, these are way more cost effective! 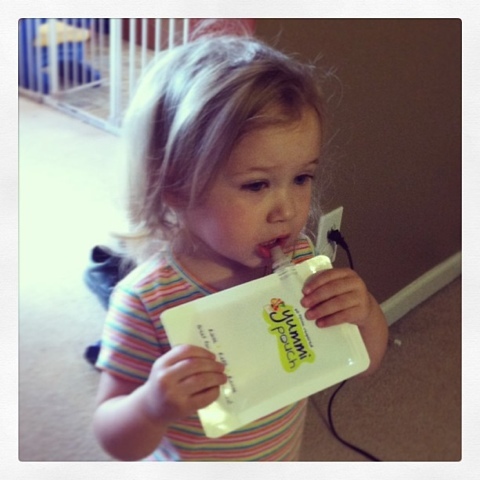 The Yummi Pouch is a convenient, refillable and reusable pouch to hold snacks for your child! It has a resealable top filling area where you can pour your favorite blended foods or drinks. The contents are enjoyed by removing the large cap and drinking from the spout. It was harder to clean than I imagined. I put them in the top rack of the dishwasher (as stated), but there was still some residue left in the pouch plus the top of the pouch was a little warped (although still worked fine). I then soaked them in hot, soapy water and felt they were clean. - Sold in sets of 6 for $14.99 HERE. Giveaway is open to US only. All entries are verified. Only required entry is to comment on this post. Although Nanny to Mommy was provided free products from yummi pouch to provide this review and giveaway, all opinions and the heart of this post are mine, as always. Awesome recipe and so going to try, because I love smoothies (as you already knew!!). Thanks for the recipe and I will have to share it with my husband as he loves Smoothies. I like that they are reusable! I like that you can use the, again! I love that we can reuse these and fill them with whatever we like! I love they are reusable! These would be fab for sick days as well as travel! I love that they are reusable and that we can prepare them and know exactly what goes in them. Love that I can choose what to put in them so I'm not limited by the pouches they sell in stores. I love it that they are reusable. My daughter would love these. 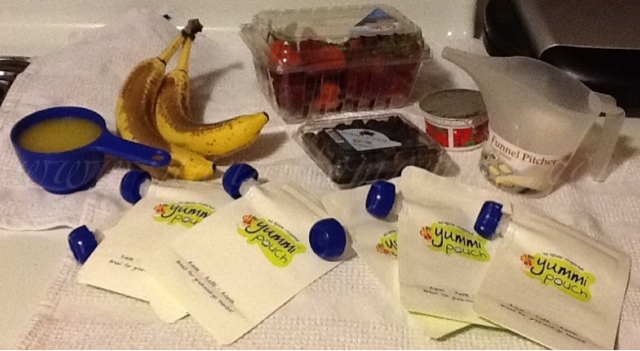 It is a great way to save money and make your own food for reusable pouches. I like that you can use dry erase markers for labeling the contents. I like that they are reusable. I love that they are reusable and you can make your own food for baby. I love the large opening on the top of the pouch. I love that they are something nutritious that we can just grab, throw in the backpack, and go! I love smoothies in the summer.